Noun. Slang (originally US). Late 20th century. (The wearing of) expensive designer clothing and jewellery. Bling-bling (or bling if you prefer) entered the vernacular in the mid-1990s through hiphop, and though the term might be starting to show its age, the allure of bling is as strong as ever. 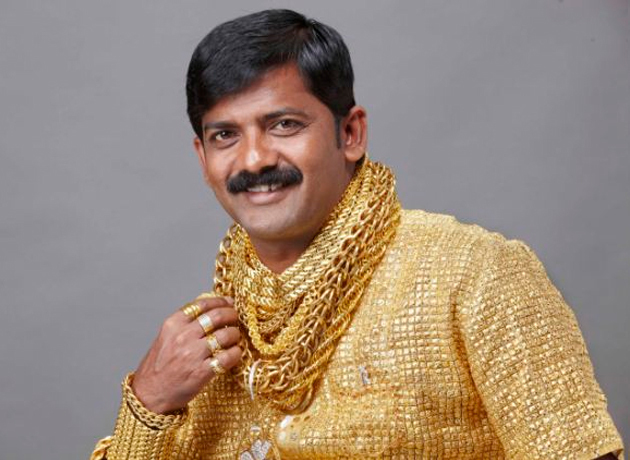 Just ask Datta Phuge, the Indian man who this year spent $250,000 on a shirt made of gold - 3kgs of gold, to be precise, taking sixteen people over two weeks to make (considering that I recently baulked at a shirt priced at €60, Mr Phuge's style is a little rich for my taste). Lady Gaga, too, trundles into the fray, having had a 24-carat gold wheelchair made for herself for while she was recovering from hip-surgery. It's no-one's place to judge, of course; perhaps she suffers from some nasty vulgar-metal allergy. If so, a wheelchair made of gold would be the sensible option. While such opulence might seem eye-wideningly decadent, the love of bling is nothing new. 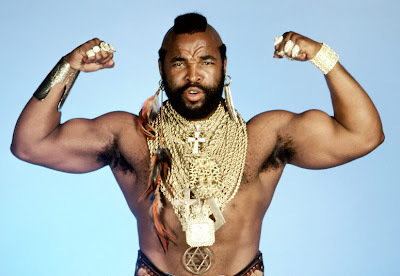 Notable über-bling-meisters include Tutunkhamun, who never seems to miss an opportunity to flash his beaming, blinged-up face to the world; the Catholic Church, to which any person that's ever visited Vatican City can attest; and King Solomon, who conscripted 30,000 men to build the palatial, gold-encrusted temple that so impressed the Queen of Sheba on a visit that may have been a forerunner to the show Cribs. For me, however, there was never a greater man than the King of Bling himself: Mr T. Not only does he sport more precious metals than a Nokia factory, he also manages to make wearing dungarees look cool. I would suggest that he deserves a medal for this alone, but I fear it would be somewhat redundant and lost. It's possible that, after its meteoric rise, the term bling-bling is starting to lose its shine. Its meaning also quickly broadened beyond the definitions offered by the likes of the OED and Merriam-Webster, so that it often denotes a showy and ostentatious display of wealth with a corresponding lack of class. Indeed, genuine wealth often has little to do with the bling that's seen on the streets, with many a catalogue-clad blingster determined to "fake it 'til they make it". I noticed on the UK's Argos website that you can buy an "imitation gold-plated men's crystal US dollar pendent" for a mere £24.99. Quite what part of that pendent is imitation is unclear, but it's reassuring that any one us can live the dream. 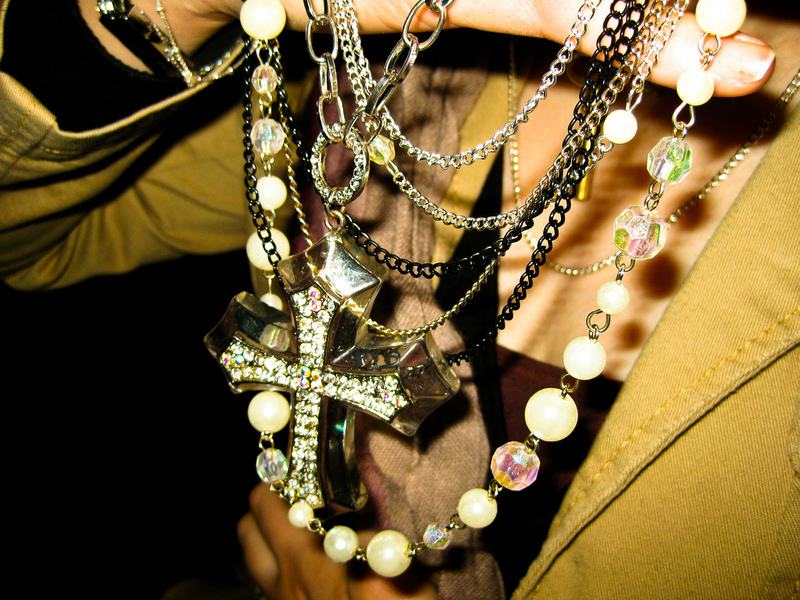 Are you into your bling? Do you fake it 'til you make it? Is your bling the genuine thing? Bling-bling is in the OED? This worries me. Today I heard that the OED is going to allow the use of the word 'literally' to accommodate people like, say, Bianca and Tracy who, having gone back to work on a Monday after a long talked-about blue-vodka weekend, tell Sharon from accounts that 'literally' *the* funniest thing in the whole flipping universe happened when they tried to get a taxi after staggering out of the club with 3 shoes and a handbag between them. Doesn't the OED have some sort of literary bouncer? - "Just turn around 'cos you ain't comin' in." The OED and English dictionaries take the view that they reflect the language we use, rather than mandate its use as happens in some languages. Twitter has been literally exploding with debate over this for the past week or so. Personally, I think that the dictionary should say how literally is used, including such common erroneous use, but it should also point out that it's not standard and makes you literally look like a total plonker if you do. As for for bling, that should be in the dictionary for shizzle.